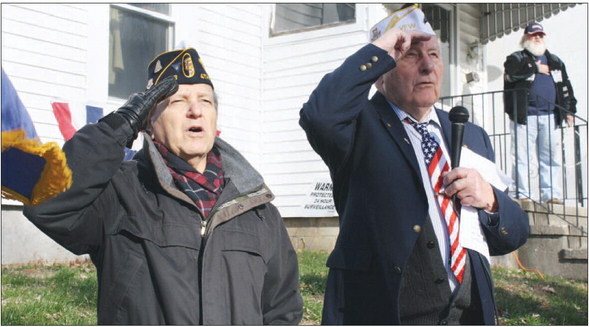 Enrico Casaletto and Hubert O’Hearn, both of Salem, salute the flag Tuesday during a Pearl Harbor remembrance ceremony at the Salem VFW post. Tuesday’s Pearl Harbor remembrance ceremony. SALEM -- Growing up with stories of her father’s experiences during the attack on Pearl Harbor in 1941, Stephanie Micklon said Dec. 7 holds special meaning for her. “I always try to come out on this day in his memory to honor his service,” said Micklon, a Salem resident and member of the Salem Memorial VFW Post Ladies Auxiliary. Warren George of Salem, was at the beginning of his 23-year career with the U.S. Army while stationed at Pearl Harbor. On that Dec. 7, Micklon said, George was returning to base when the attack hit. He had to jump from his vehicle to narrowly escape an explosion, she said. On Tuesday, Micklon and about a dozen members of Salem veterans groups gathered at the Salem Memorial VFW Post to honor the thousands of military personnel who did not make it out of the attacks alive. But with the more recent attacks of Sept. 11, O’Hearn said he worries some have let the memory of Pearl Harbor slip away. Post Senior Vice Commander Robert Ventullo of Salem, who served in Iraq and Afghanistan, said he agrees. But Salem High School senior Chris DiPersio said there are still some young people for whom Dec. 7 holds meaning. 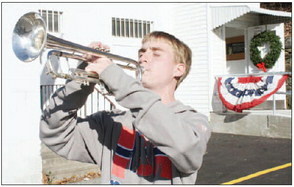 DiPersio played taps on his trumpet during the Tuesday ceremony. And for their part, post chaplain George MacLean of Salem said local veterans will continue to keep that memory alive.